The Sandals Foundation is always seeking corporate entities and individuals to partner with on education, community and environmental projects that will contribute to the positive development of the Caribbean region. Founded in 2009, the Sandals Foundation – the brainchild of Sandals Resorts International’s CEO, Adam Stewart – is a culmination of 30 years of corporate social responsibility on the part of Sandals and Beaches Resorts. As a charity in an under-developed region with unlimited amounts of potential, the Sandals Foundation understands that in order to truly have a sustainable impact and make a difference in the lives of our Caribbean people, partnerships with like-minded entities are key. Partnering with Pack for a Purpose has helped open doors to greater opportunities for our Caribbean children’s education. 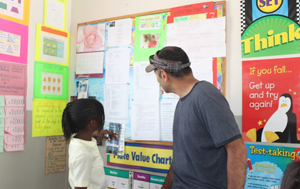 This relationship has made it possible for anyone travelling to Jamaica, Saint Lucia, the Turks and Caicos Islands, Antigua and the Bahamas, to take at least five pounds of much-needed supplies that have been requested by local area schools. We’re the first to admit that we welcome the support of as many partners as possible, as we remain committed to our cause – holistic and sustainable development using education as the tool. Through Pack for a Purpose, we as a company have been able to get visitors to our resorts to pack their suitcases with materials that are so desperately needed. 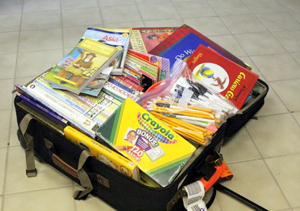 It’s amazing that through this groundbreaking, non-profit organization, nearly 900 pounds of school supplies had been distributed in 2012 to many of the 26 early childhood, primary and high schools adopted by the Sandals Foundation across the islands. The Sandals Foundation is truly blessed to have attracted the support of thousands, having been in operation for just three years (we marked our third anniversary on March 18). 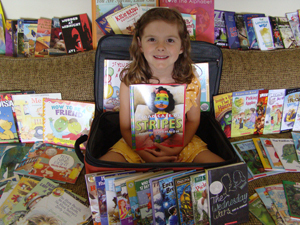 These donations from vacationing guests, corporate sponsors and industry partners go far in filling the empty shelves of newly constructed school libraries, and are being used in hundreds of classrooms to enhance the learning experience for our students. Reflecting on the past three years, the Sandals Foundation will always remember our wonderful travel partners who believe so strongly in our cause and show their support by giving back to region they love selling and sending their clients on vacation to. Special appreciation goes out to Nina Patel of Vacations that Matter for her on-going contributions and for being instrumental in introducing us to Rebecca Rothney and Pack for a Purpose. As we embark on 2013, the Sandals Foundation would like to thank all of you who love our Caribbean home so much that you want to continue to give back in so many ways that we cannot count. We look forward to your continued packing for a purpose and to making the Caribbean a brighter place!